Games Education meet with McEnroe, Nastase, IMG Academy, Michael Johnson, Niall Quinn, Les Ferdinand, FC Bruges, Bayern Munich and the list goes on!! » Club Brugge now HotSpot Users!! Club Brugge have taken delivery of HotSpot under the guidance of Head Academy Coach Henk Mariman who saw the system in Qatar at Aspire 4 Sport. Games Education are proud to become partners of Science and Football - a great combination of coaching and sports science in football. 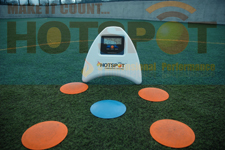 See the HotSpot demonstration team at the Science and Football conference this weekend! Can you beat the trainer? Hotspot PRO system AVAILABLE NOW! Now with vertical jump height included! The PRO system consists of 4 spots with a dedicated "test" spot. Benefits : increased sensitivity improving reliability ; "test" spot for start and stop tests and other standard tests including vertical jump height analysis. Drills are unlimited and allow coaches to devise activities and tests for their sport. Test an athletes agility in standard movement patterns or test/train specific movements such as "flow" steps in tennis and "cut" moves in rugby and football. Professional ATP Tour Tennis Coach Yves Latreille a Hotspotter himself has joined GEL as a Hotspot representative. Yves brings a wealth of tennis specific knowledge to the company and will be actively promoting the system across Europe. Yves is a certified Sanchez Casal Academy Coach. The highly respected Spanish methodology ties in well with Hotspot and it's progressive philosophy. Games Education is committed to providing accessible technology to the sports,fitness, education and leisure sectors. Our products aim to provide motivation through wanting and striving to improve every time we take part in physical activity whilst providing for a positive and purposeful experience. Whether searching for that extra 1% on game day or engaging in exercise Games Education aims to provide a solution for you.